Iran has mountains striped with snow, dense forests where bears and lynxes still roam, deserts, bazaars...but above all it has stories - of fairies and demons, of a monstrous metal eagle called the okab, of romantic cockroaches and foolish weavers. During her travels, Elizabeth Laird has gathered a wealth of stories, and here she retells, in her own inimitable style, some of Iran's best, with delightfully offbeat illustrations from Shirin Adl. Pea Boy is a beautiful introduction to the Iran we rarely hear about. 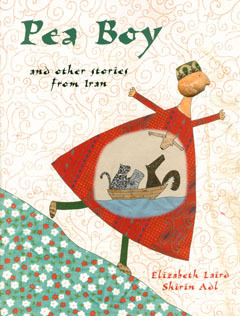 Pea Boy and other stories from Iran by Elizabeth Laird and Shirin Adl is available to buy now.